While no American distance runner should be considered a lock for a medal in Rio, Boris Berian is about as safe a bet as you can find. But before he gets a chance to even go out for the Olympic squad, he’ll have to get through Nike and its lawyers first. After being crowned world indoor champion in Portland, Berian set his sights on Olympic gold in Rio de Janeiro. He opened his season on April 30 in Des Moines, Iowa, where he ran 1:47.29 to finish second at the Drake Relays. But on May 20, his outdoor season would be derailed at a meet he wasn’t even competing in. Berian went to the Hoka One One Middle Distance Classic in Los Angeles to cheer on his Big Bear Track Club teammates; Nike served him with a lawsuit at the meet. According to court documents, Nike claims that Berian breached his contract with them by signing with New Balance in January. While Nike’s contract with Berian expired on December 31, a clause in the contract allows Nike to match any offer made in the next 180 days. Today, I got served at the Hoka Classic, @nike is going to sue me for breach of a contract that expired on 12/31/15. What shall I do? Im currently not in any contract. My Nike sponsorship ENDED last year. Nike FAILED to match NB offer. For some reason Nike is fighting that. Court documents show that on January 19, Berian’s agent Merhawi Keflezighi had informed Nike that Berian had agreed to a contract with New Balance worth at least $375,000 over three years, an amount that could increase with bonuses for performance. Nike claims that they matched this contract on January 22, meaning Berian would remain a Nike athlete. In statement submitted to the court on June 17, Keflezighi made public the full contract Nike offered to Berian in response to the New Balance offer. That contract contained eight reduction clauses, each one threatening to reduce Berian’s contract between 20 and 50 percent. These reduction clauses are the reason that the Berian camp claims the Nike offer is not equal to the New Balance offer. William Ferranti and Vince Ewing, both lawyers for Berian, declined to comment on the case. Per Ramsfjord, the lawyer representing Nike, did not respond to requests for comment. Berian has the support of others in the track and field community. 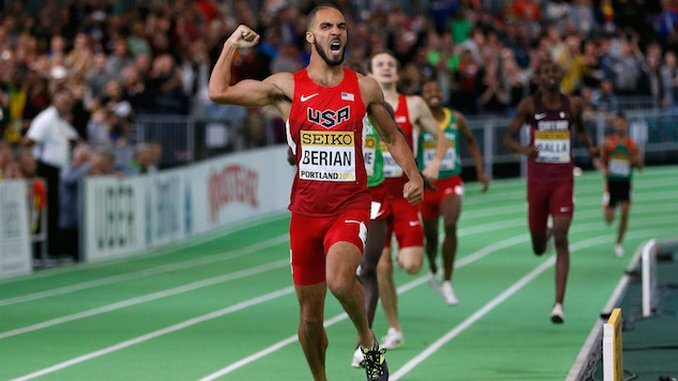 Olympian Nick Symmonds, Oiselle Running CEO Sally Bergeson and Brooks Sports Senior Global Sports Marketing Manager Jesse Williams have all filed affidavits in support of Berian. All three claim that reduction clauses are unfair, and the inclusion of reduction clauses would mean that Nike did not match the New Balance contract. In a statement filed with the court, New Balance General Manager of Running Sports Marketing John Evans wrote that while Nike claim’s reduction clauses to be an industry standard, “New Balance does not, as a standard business practice, demand reduction provisions in its contracts with runners. I’m glad I could sign a Declaration today in the case of #NikeVSBerian to state that reduction clauses are not industry standard. Though Berian raced a week after being served—he ran 1:44.20 to win the 800 meters at the Prefontaine Classic in Eugene, Oregon on May 28—the lawsuit would quickly bring his season to a halt. U.S. District Court Judge Marco Hernandez granted Nike a temporary restraining order on June 7, barring Berian from competing in meets while wearing New Balance products. The temporary restraining order is still in effect. In a statement filed with the court, Keflezighi argued that Nike has exaggerated the financial damages it will suffer if Berian competes for New Balance. Keflezighi pointed out that Nike sponsors Team USA, so the uniform that Berian was required to wear at the World Indoor Championships and would be required to wear at the Olympics would feature Nike labels. At the biggest track meets in the world, Berian would, in effect, still represent Nike. The case may soon be resolved. Though Berian has not yet been to court to formally respond to Nike’s lawsuit, on June 10, lawyers for Nike and Berian filed a joint resolution to give Berian until June 24 to do so. This is a 14-day extension that gives both sides more time to try and reach a settlement before public proceedings begin. Meanwhile, Berian’s agent has launched a crowd-funding campaign to cover legal costs. Both Berian and Nike are likely trying to settle this dispute outside of court as soon as possible. The matching period of Nike’s original contract expires on June 28, and Berian is hoping to compete in the U.S. Olympic Trials that set to begin on July 1.